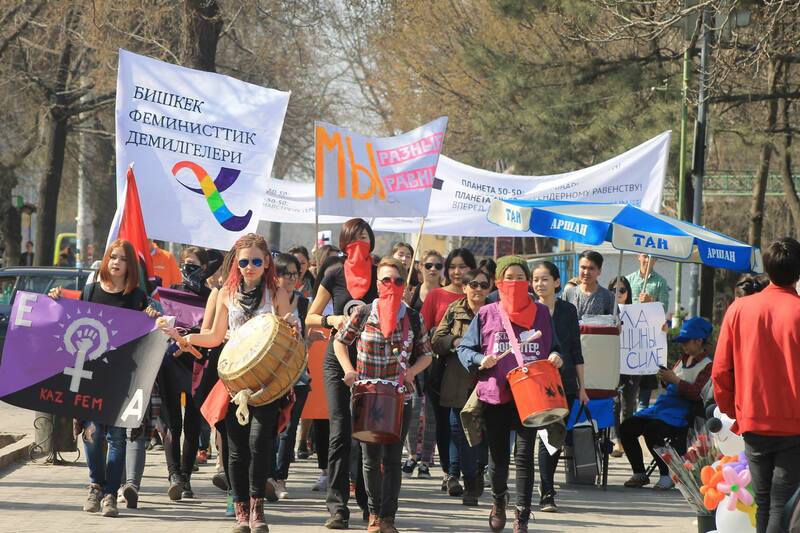 Dozens of people in Kyrgyzstan’s two main cities used the occasion of International Woman’s Day on March 8 to gather in solidarity with victims of domestic violence. The holiday is typically a light-hearted affair in Kyrgyzstan and the rest of the region — an occasion for men to lavish flowers or other gifts on their female colleagues, spouses or other women in their life. But feminist groups seized on the opportunity to remind the public about the problem of violence and discrimination that they see perpetrated against women in the country. “For some reason, most of the population sees this as the holiday of spring and flowers. In reality it has lost its true meaning. We wanted to draw the attention of the public and the government to the problems that women face every day,” said feminist activist Reina Arturova. Arturova and around 100 other people took part in a march in Bishkek that took them past monuments to two well-known female figures in Kyrgyzstan history. Kurmanjan Datka was an important political figure in Kyrgyzstan who united Kyrgyz tribes in the face of Russian aggression in the 19th century before succumbing to Moscow. Before doing that, however, she is said to have fled a man who had kidnapped her for marriage, making her an appealing role model for many Kyrgyz women. Urkuya Saliyeva, meanwhile, was a reforming activist in the early Soviet period. Arturova said that although women in Kyrgyzstan are often subjected to violent crimes, many of them often refrain from going to the police or pursuing legal action. This fact was documented in detail in a Human Rights Watch report published in October 2015 that noted that women in Kyrgyzstan suffering from domestic violence are chronically unsupported by the legal system. The report also argued that social norms also played a part in compounding the widespread problem because of the culture of victim-blaming and stigma attached to domestic violence. Arturova said that while the law recognizes gender equality, practice shows otherwise. Around one third of women in Kyrgyzstan has been victim of violence, Arturova believes. “Everybody thinks that you should just give women flowers and they will sit happily at home. But in truth this is the day when you have to go out and say that we are fighting for the rights of women,” she said. A march was also held in the southern city of Osh, which is generally deemed far more conservative than Bishkek. Around 40 female activists holding up signs walked through the city.